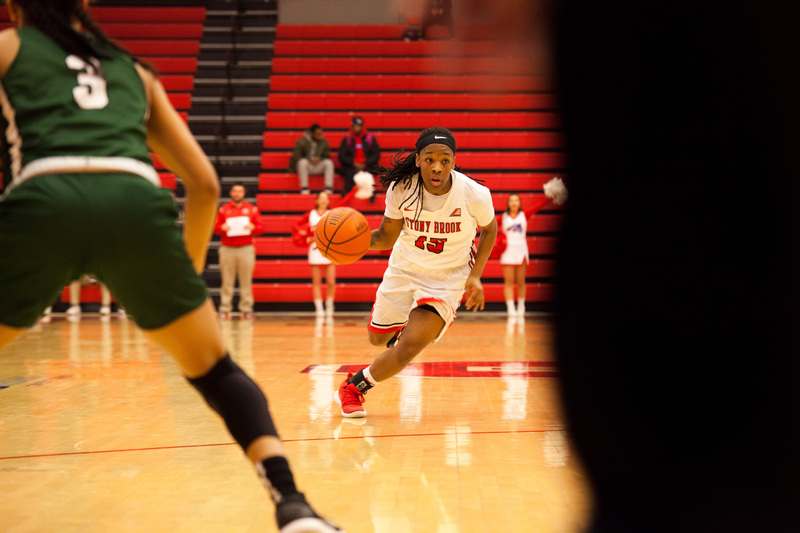 The women’s basketball team blew out Hofstra 77-49 in its home opener Tuesday night. The victory comes off the team’s season-opening loss against Rutgers University on Nov. 9. The Seawolves got off to a quick 10-0 run to start the game. The lead was created by an aggressive defense, as the team totalled five blocks, two steals and forced six Hofstra turnovers. To complement their defensive effort, the team’s offense was also firing on all cylinders with rapid ball movement, screens and open 3-pointers. Senior guard Shania “Shorty” Johnson led the team on the floor with nine points, five assists and five rebounds to help the Seawolves build off their great start to create a 42-23 halftime lead. The Seawolves continued their fast-paced energy and went on another 10-0 scoring run in the third quarter. After that run, the Seawolves coasted by the rest of the game, and were able to maintain their 30-point lead for much of the fourth quarter. The team was able to control the game using a balanced attack from multiple key players. Johnson finished the matchup with a double-double with 14 points and 10 assists. Senior guard Matthews led the team in points with 20 and accounted for four 3-pointers while shooting 50 percent from the field. Pagan grabbed seven rebounds while also tallying 10 points. Warren came off the bench to score 16 points in just 22 minutes. “After this we’re gonna keep doing what we’re doing, going hard every day in practice and just keeping up the good energy,” Johnson said. The Seawolves starts off their season with a 1-1 record for the first time since 2015-16. The team will try to replicate this victory against Manhattan College in New York City at 2 p.m. on Saturday, Nov. 17.